The Page Edit screen is where all page level editing is done. This encompassess page metadata (e.g. page title, listing information, event date, article author, menu settings) and page content (i.e. text, images and media visible on the page). Since the introduction of Content Worklow, page editing controls are located in the page editing menu. If a Published version of a page exists and there is no Draft or Needs review version, you can edit using Quickedit. 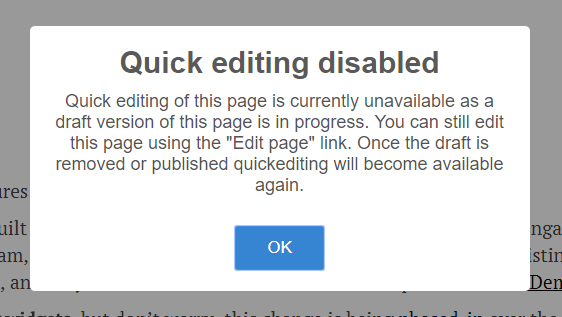 If a Draft or Needs review version of the page exists, Quickedit will not be available and the following message is displayed when a user attempts to use Quickedit. Revisionable and non-revisionable page content is separated on the page edit screen into sub-sections: New/Edit draft; Moderate; Settings. The New/Edit draft screen contains revisionable content - i.e. page content that can exist in a draft, separately from a published version of a page. *Visibility depends on the page layout that is selected. The Moderate screen allows viewing of and reversion to previous versions of the page content. See Content Worfklow documentation for information about moderation. The Settings screen contains the page's non-revisionable information. If a change is made to a page's Settings, these changes are effected when the page is saved in any state (Draft; Review; Publish; Schedule publish). Each page has at least one URL alias. On creation of the page, the alias is generated automatically based on the page title. There will be more than one alias, each with a radio button on the left. The radio button of the primary alias is blue.